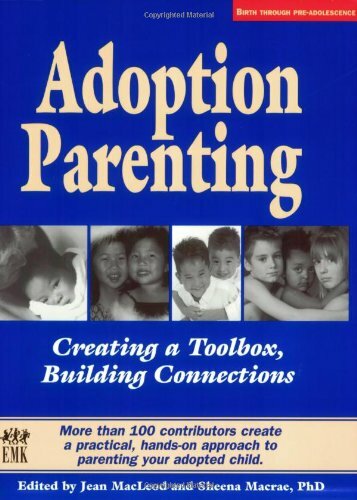 Categories: Adoption Parenting, Adoption Professional Basics, Agency Essentials, Child Care & Parenting, Classic Adoption Books, Siblings in Adoption, Tapestry Picks, Teen/Older Children, The Adoption Professional, Transracial Adoption. Its the What to Expect for adoptive families! Over 100 contributors have woven a stunning tapestry of advice for adoptive parents. 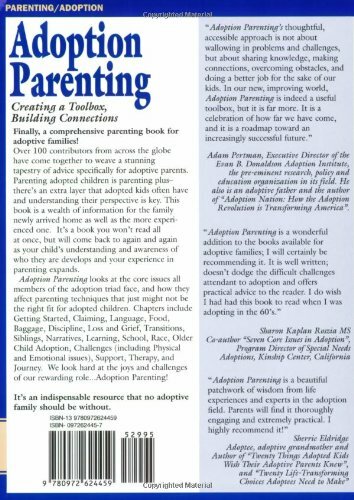 Parenting adopted children requires understanding the extra layer and this book helps in that understanding. Appropriate for the newly created family or the more experienced, Adoption Parenting looks at stumbling blocks to good parenting and standard parenting practices that arent appropriate for adopted children. It looks at the core issues all members of the adoption triad face, and at how it affects standard parenting challenges like sleeping through the night, discipline, and attachment. Adoption Parenting covers specific challenges families have faced: dealing with grief and loss, FASD, Trauma and PTSD, Sensory Integration, Speech and Language delays, and ways to effectively parent a post-institutionalized child or a child who has experienced trauma in their journey to you.